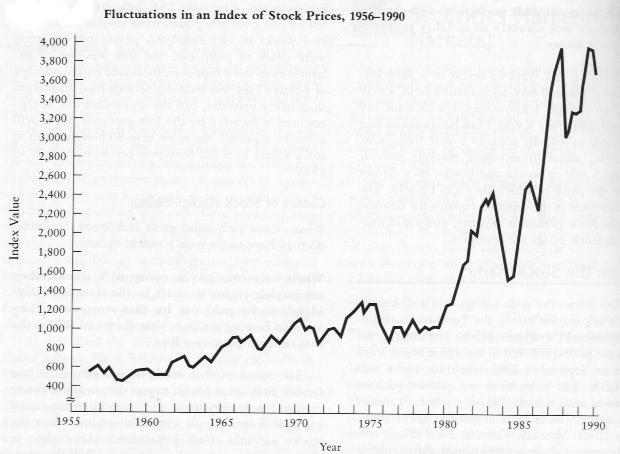 The prices of individual shares of stocks are meaningless. This fact should be obvious, but it turns out the world doesn't understand. Read more only if you're ready to learn why, and then be beaten into submission with how silly people can be about such things. Companies trade on the market via these things called shares of stock. When you own a share of stock, you own part of a company. For example, if company C has 1,000,000 shares of stock outstanding, and you own 1 share, you own one millionth of C. Now let's say company C's shares are each worth $50. That means the total market value of C is $50 million (1,000,000 shares x $50/share = $50 million); this $50 million figure is usually referred to as the market cap of C.
Every once in a while, some companies decide to "split" shares of their stock into more shares. Using our example, company C could split each of it's $50 shares into two $25 shares. Then there would be 2,000,000 shares of C outstanding, each worth $25. The market cap of C remains unchanged: 2,000,000 x $25 = $50 million. In fact, not much about the world has changed, except that individual shares are now worth half as much, and the owners have twice as many as before. A "stock split", as the process is called, doesn't really change the world. Companies can pretty much split however much they want. They can even reverse split, say turning two $50 shares into one $100 share. Most companies use splits and reverse splits to maintain a share price somewhere around the $5-$200 range. It's not clear why they do this, but one reason that is often stated is that average-joe type investors are intimidated by extremely high share prices. As an extreme example, Berkshire Hathaway A shares cost over $100,000 each. Who but the super-rich can afford that? On the flip side, if a stock becomes too cheap, the transaction costs incurred by crossing the bid-ask spread when it's, say 5% of the price of the stock, become egregious. The point of it all is that stock splits don't really have anything to do with the value of the underlying company. If a company's stock price is low, that doesn't mean it's "cheap" or a good value. Similarly, if it's high, it doesn't mean get out now before it comes down! Perhaps this seems obvious. Alas, the world does not bear out this obvious fact. As my first example, I'll tear apart the Dow Jones Industrial Average. The Dow is approximately the worst index you've ever heard of, because it bases its value on the per-share price of its component companies. Specifically, it is a price-weighted average, meaning higher priced stocks have a greater weight than lower priced stocks. But what if the lower-priced stock just underwent a stock split? Should that company's weighting in the Dow suffer? It does. Company A has 20 million shares outstanding at $10 each (market cap = $200 million). Company A has 20 million shares outstanding at $9 each (market cap = $180 million). Company B has 2 million shares outstanding at $101 each (market cap = $202 million). On the second day, company A has lost a huge fraction of their value, and company B has made a tiny gain. What happened to the index? It was unchanged because it's based on the per share price of the stocks. $9 + $101 is still $110, which is the same as yesterdays prices added up. If you owned 100% of both companies outright, you would have been very sad that day, because you would have lost a bunch of money. Shouldn't the index which is supposed to benchmark the companies inside it reflect this fact? The Dow is an ancient index from way back when people used to trade on the floors of exchanges by screaming and waving papers (oh wait, they still do that.. but that's a rant for another day). Maybe the rest of the world is saner. I thought for sure real-life investors putting their hard earned dollars into stocks would understand the obvious irrelevance of per-share price. Sadly, not so. And by an immense margin. Examine this column from a recent Wall Street Journal. It compares some attributes about Midcap Value mutual funds. Scan down a to "10 biggest funds" to note which is the biggest fund. The investment seeks capital appreciation. The fund normally invests at least 80% of the assets in low-priced stocks. Low-priced stocks are those that are priced at or below $35 per share currently or at the time of the fund's investment. Stocks whose prices rise above $35 after purchase continue to be considered low-priced for purposes of the 80% policy. For convertible preferred stocks, FMR may consider the price of the security itself or the price of the security into which it is convertible. They invest in low-priced stocks. Can you imagine the sales pitch, during a meeting with Fidelity representatives at the end of a long, boring, uninformative 401k session?